Upon its original release, The Division was far from perfect and gamers were not shy with their criticisms. Players immediately took issue with everything from Loot Box systems and rampant hacking to Bullet-sponge enemies and the fact Ubisoft’s looter-shooter offered literally no end game content. But that was then- this is The Division 2. Since the release all the way back in March of 2016 there have been a number of updates, and a slew of DLC’s released to the titles now loyal base. One of the reasons the DLC’s, and in particular the latest 1.8 update have been so well received is due to the fact the developers are actively listening to players feedback. This is a lesson the developers over at Bungie have yet to learn as more and more players switch from Destiny 2 to The Division. Now, over two years since the launch of The Division, we are finally catching our first glimpses of The Division 2. No longer set in the wild winter wonderland of New York City, The Division 2 drops players in Washington, DC, the Nations Capital. Players will battle their way through the swamp draining it of rebel groups, contract killers and vicious Patriot Militias with nothing but bad intentions. Now let’s take a look at a few of the updates and new features players can look forward to enjoying during their playthrough of The Division 2. This is usually a given with any sequel but what doesn’t usually change so drastically is the location. Moving the gameplay out of the often dark and dreary New York setting to sunny D.C. has given developers the opportunity to play with light and shadow in a way they couldn’t in the last game. This simple change has already greatly improved the look of the game and has given the franchise a direction to go in the future – exploring and liberating different metropolises throughout the country. The footage coming from E3 has been in beautiful 4k resolution and gives the environments the depth and detail they deserve. It is clear Ubisoft does not want to make the same mistakes they made in The Divison so this time they have developed some cool endgame perks. One of these is called Specialization. When you play through The Division 2 and reach level 30 you will be able to pick one of three specialized weapons to add to your inventory. Each specialized class will center around a certain weapon type and will also offer a new set of skills for your character. As of now the weapons for the specialized classes look to be a Sniper (sharpshooter class), Grenade Launcher (demolitionist class), and a brutal Cross-Bow (Survivalist class). You will still have access to the three main weapons slots you were previously alotted now there will simply be a fourth which holds your Specialized Weapon. This will help you balance squads when participating in the newly announced Raids. 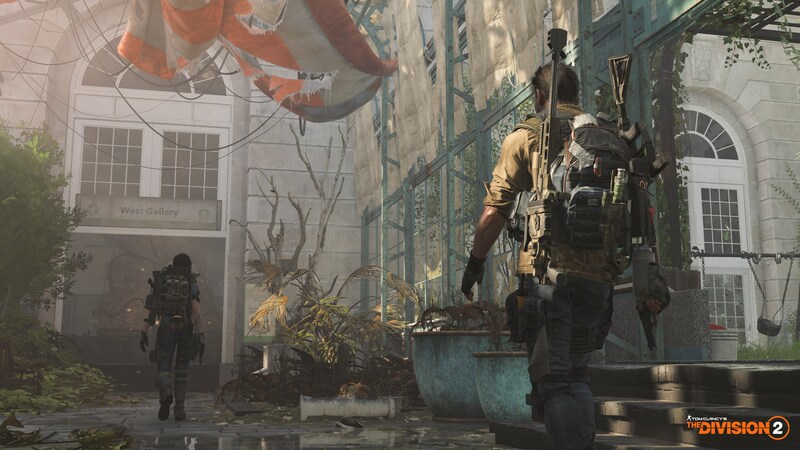 Raids are not a new concept in online gaming, however, The Division 2 may just pull players away from their most cherished games. In the case of Destiny 2, pulling players won’t be much of a chore. Destiny fans are disenfranchised with the serious lack of Raids offered in the highly anticipated sequel. Ubisoft and The Division 2 development team won’t make this same mistake. We can expect massive 8 player raids coming to The Division in 2019. Originally the Dark Zone was supposed to be the end game experience players would dive into after completing the storyline in the original Division title. However, it didn’t really work like that. The Dark Zone became a nightmare environment for any player who hadn’t yet reached level 30. Not only that the Dark Zone ranking system kept players from reaping any gear rewards when they did venture into the Red portion of their Map. Not much is known about the improvements coming to the PVP and Dark Zone. There have been rumors of an increase in the number of players in the Dark Zone at any given time which may lead to some fun gameplay experience but it doesn’t fully solve the problem. Additionally, there is a battle royal rumor surrounding The Division 2 that won’t seem to go away. If its true or not – only time will tell. Regardless of what the final PVP looks like for this game developers have claimed to be completely committed to improving the experience.